A new event has arrived in the Old Market Square this week. It's a festival about the caves that run under the city centre. There are meant to be hundreds of them. There's a lot of them you can visit. The most well known is Mortimer's Hole, which was a secret route into the castle. There is a virtual reality tour of them, where you wear some special goggles and can explore this underworld, without leaving the confines of the marquee. I didn't get the opportunity of doing it today. But hope to sometime this week. Of course my mate Tim, who is Nottingham's official Robin Hood was there to promote the event. Lots of visitors kept coming up to him for a photograph and to say hello. 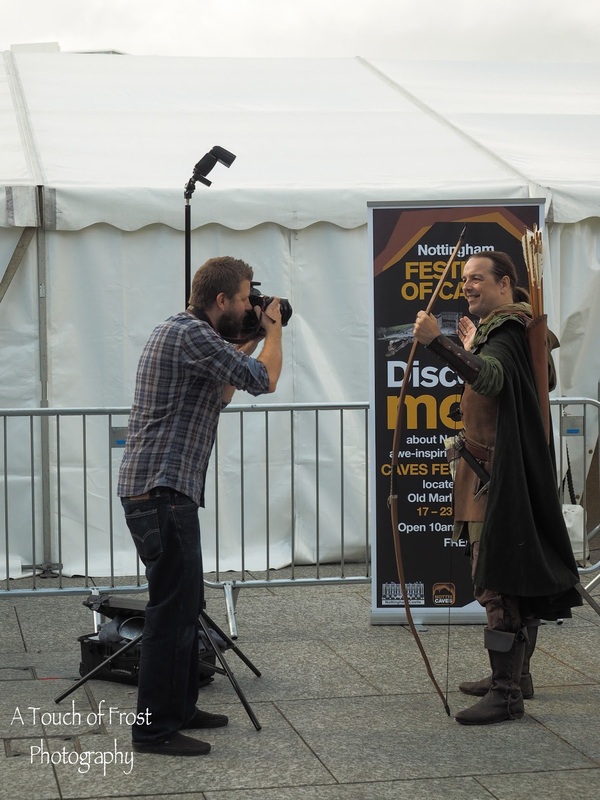 A photographer from our local paper, the Nottingham Post was there to capture the event for its readers. Here's Tim posing for the camera. I'll expect to see him on the front cover of tomorrow's edition.